Several suggestions were put forward with soph coming close with the suggestion of a broken furcula and Lena and henstridgesj correctly suggesting the clavicles (or collarbones) of a Cat Felis catus Linnaeus, 1758. Cat clavicles, like the clavicles of a variety of other animals, are much reduced and are no longer connected to the scapulae (shoulder blades). This allows the scapulae to move much more freely during running, which can increase stride length and in the case of Cats it allows the animal to fit through holes big enough to get their heads through (assuming the Cat isn’t a bit too portly). These sorts of vestigial structures are interesting from an evolutionary perspective, since they serve little or no direct function, but they still develop as a result of inheritance from ancestral forms that did use them. In the case of Cats that form would have been around quite some time ago (probably 61.5 – 71.2 million years ago) since the closest related group to the Carnivora with a well-developed clavicle (that I can think of) would be the Chiroptera (bats), where it plays an important role in flight. 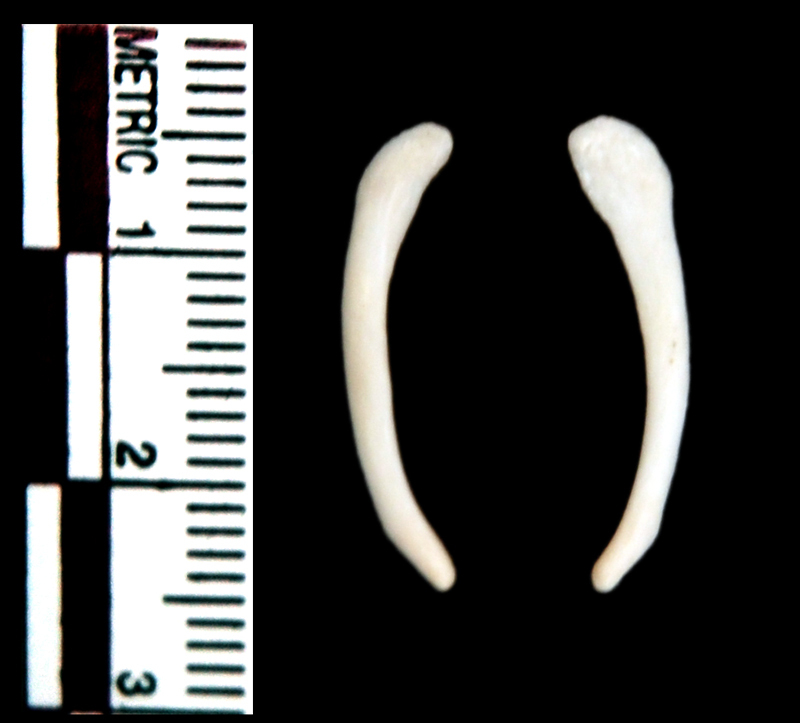 Since that divergence of the Chiroptera and the lineage giving rise to the Pangolins, Carnivora and Ungulata the clavicle has been pretty much completely lost, so it’s interesting that even a vestigial form occurs in Cats. It’s funny to think how such small bones can raise questions that lead us through millions of years of evolution in search of answers, but that’s the nature of studying nature! You may have noticed some coverage in the press recently about the Aquatic Ape Hypothesis (AAH), sparked by a conference on the topic due to be held in May. 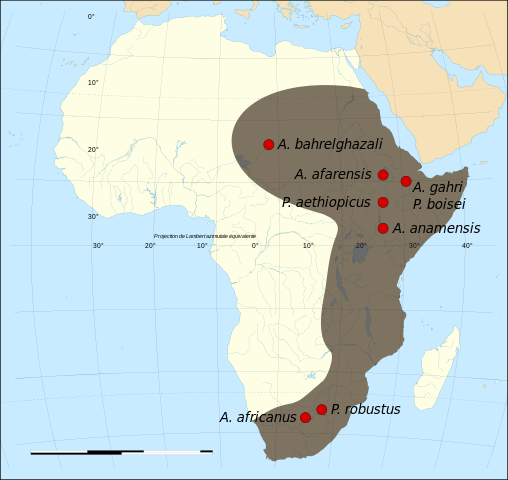 If you’re not familiar with the AAH it basically suggests that human ancestors passed through a semiaquatic stage which provided the selective pressure that has led to the differences seen between humans and other primates. Some people call it the Aquatic Ape Theory, but it lacks the necessary scientific support to be considered a theory so it remains a hypothesis [see comments for discussion of the terminology]. The idea was first suggested by pathologist Max Westenhöfer in 1942 and the first line of evidence in support of the hypothesis was proposed by marine biologist Alister Hardy in 1960. Hardy noted that subcutaneous fat is unusual in terrestrial mammals and is normally associated with marine mammals – raising the very good question ‘why do humans have subcutaneous fat?’ (the answer being because we eat too much and exercise too little – just like some lab monkeys). Elaine Morgan is a great communicator and she’s done a remarkable job of delivering the AAH to a wide audience, but I have concerns that the packaging is more impressive than the contents, from a scientific perspective. In the video Elaine does a cracking job of setting up the AAH in opposition to the more established Savanna Hypothesis (SavH), which suggests that humans diverged from other primates as a result of exploiting more arid environments. She then suggests that the SavH has been discounted on the basis of palaeoenvironmental data, leaving a paradigm gap that should (she suggests) be filled by the AAH. But of course, a paradigm gap should only be filled by a robust theory and when it comes to plotting evolutionary trajectories there is not solid theoretical foundation on how to do it, beyond relying on the physical evidence provided by the fossil record. In this case that would require fossils of human ancestors to be found in primarily aquatic deposits, something which we do not see, which is surprising, since aquatic environments are usually far better for fossil preservation than terrestrial environments. In fact, taphonomy suggests that early hominid fossils would be more common if the individuals were living and dying in water with any frequency. Without having physical data in the form of fossils linking hominids to water, it becomes difficult to make a connection without falling back on evolutionary ‘just-so stories‘, that try to explain an observation by relying on a plausible narrative. The trouble with this is that the public and media love a good narrative, but it simply isn’t scientific unless it can be falsified. 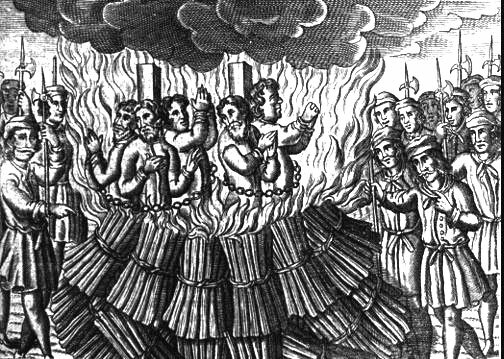 I think this is the part of the process that Elaine Morgan doesn’t quite grasp – she is convinced by her own narrative and believes in the hypothesis, but for a scientist it is more appropriate to subscribe to none of the available hypotheses if they cannot provide factual evidence in support. This is where I currently stand. This statement starts by comparing two utterly different species, with a very different evolutionary history and current mode of life, then offers a single dietary explanation for the difference in brain size. This is patently nonsense. If a seafood diet is the main driver of large brain size then the relatively very large brains of Chimpanzees and other Apes become a remarkable oddity and the relatively small brains of Blue Whales become bizarre variants. Moreover, what about people that don’t have access to seafood? Are they unable to grow large brains? No. Clearly there is more going on. Brain size is not directly linked to a single dietary chemical, it is linked to managing interactions in and with a complex environment – keeping track of seasonal and spatial variation in fruiting or schooling of fish, coordinating group efforts and understanding prey behaviour to hunt more effectively, or problem solving to access food sources that are hard to acquire. Where a big brain provides a selective advantage, it will evolve. I don’t want this post to turn into a refutation of the AAH, since there’s a lot to say and much has been done elsewhere. What I do want this post to do is highlight that a scientific theory needs to be testable, it needs to consider contradictory information and it needs to be aware of confirmation bias. The AAH relies strongly on observed similarities in condition between humans and aquatic mammals, but it dismisses other similarities out of hand. For instance, Naked Mole-rats are simply dismissed by Morgan as an example of a non-aquatic mammal that has lost body hair, but they provide evidence that hair loss can occur for reasons beyond aquatic adaptations – which is worthy of note. It is also worth considering the supporting examples in the context of phylogeny and physiology, which doesn’t seem to happen often. For instance, the Cetacea, walruses and Sirenia are examples of naked aquatic mammals cited in the AAH, but both the Sirenia and walruses retain a short coat of hairs, quite different in structure to the fine body hair of humans. Whales and Sirenia have also been adapting to an aquatic habitat for 50 million years and the ‘nakedness’ of modern examples may be more related to the evolution of large body size and the benefits to thermoregulation provided by mass – which is supported by the fact that the largest species in the Pinnipedia (like the Elephant Seal and Walrus) are much less reliant on fur than the smaller species of seal. Unless our ancestors were massive, it seems unlikely that they would have been losing their hair in order to survive better in the water. Of course, that’s not to say that our ancestors avoided water – far from it. Marginal environments are rich sources of food and most terrestrial animals that live near water will exploit it in some way or another. I’m sure our ancestors would have done the same, I’m just unsure about how immersive and influential that exploitation was on our evolutionary trajectory. So far I am unconvinced by the AAH and the more bad science and overstated arguments I see in support of it, the less convinced I become. Let’s see if any good supporting science with hard facts emerge from the conference in May.